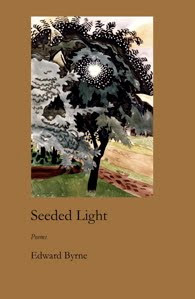 I am pleased to note that one of Sunday’s (8/15/10) book reviews—“Light, Shadow and a Hint of Heartbreak”—in the Arts & Entertainment section of The Philadelphia Inquirer contained commentary on my latest collection of poems, Seeded Light. Certainly, any poet feels fortunate and celebrates whenever his or her book receives positive attention in a major newspaper; however, I was especially delighted by reviewer Frank Wilson’s focus on likenesses detected in personae or topics threaded throughout the volume’s particular works, as well as his identifying how various poems complement each other from page to page, inviting a larger understanding of the whole book. Wilson observes that the collection displays a continuing presence by couples in mysterious circumstances, as well as recurring instances in which speakers are reflecting upon various travels, literally or figuratively. In addition, characters involved with arranging images of the world around them, such as a painter or a cartographer, disclose how they alter reality for the sake of their artwork. The review reveals an attention to apparently ongoing scenes constructed in a subtly connected story line, perhaps presenting a number of poems that offer readers variations on a theme or that present multiple perspectives on individuals in similar situations. I was delighted to find patterns placed within the poems had been identified by this reviewer, since I view such elements as essential in my organization of a poetry book. As I tell my students, although readers might decide upon favorite poems they will revisit frequently, a book of poems often ought to be encountered as a whole in which the separate pieces complement one another and contribute to a distinct, maybe greater, overall impression. When compiling works for a manuscript, like many poets, I not only consciously develop a progression of poems to be read in order, but I am also aware of images or actions, words or phrases, line lengths or stanza forms that might resemble or echo one another from poem to poem. Sometimes my book’s structure is apparent to all from the beginning. For instance, Tidal Air exhibits an arrangement suggested by its description on the cover as a “book-length diptych.” Likewise, a current work-in-progress, Autism, is labeled as a book-length poem consisting of works I have “designed so that they may be viewed as independent items; however, I have consciously carried themes, images, and similar language through the extended sequence with the hope that connectivity and continuity will be preserved among numerous sections of the long poem.” On other occasions my books have been configured with sections more subtly determined by chronological, geographical, or thematic concerns evident within the poems. Clearly, none of this is innovative, since poets have frequently presented their poems in sequences or patterns throughout time. In fact, my interest in the complementary nature of poems read together probably began during my days as a student examining Elizabethan sonnet sequences. Many of my favorite books by American poets also have designed sequences or series of poems meant to be read in succession as companion pieces or supplementary works. Indeed, quite a few of the poetry books I have reviewed over the years have interested me precisely because of the power presented by the volumes as a whole rather than by my sole attention to some outstanding poems considered apart from one another. Perhaps I am especially conscious of this issue because I am afraid such an outlook on addressing a collection of works seems to be slipping away for varying reasons. In fact, a couple of friends who happen to be favorite poets of mine have confided to me that they do not worry very much about the order of poems in their books anymore because they believe most readers likely will not read the volumes from front to back, but instead will dip in and out of the book, sometimes jumping to poems displaying compelling titles in the table of contents. Additionally, I am reminded daily how experiencing various types of technology or art might be more haphazard nowadays. Indeed, I am guilty as well. Having grown up in an era when I bought record albums—such as The Dark Side of the Moon or Sergeant Pepper’s Lonely Hearts Club Band—and enjoyed hearing them them as complete entities in which single songs existed as parts of a whole, I am reluctant to admit that I also appreciate the convenience of song mixes on my iPod, to which I listen in shorter sporadic intervals. Moreover, browsing the Internet invites me to participate in random sampling of works from a number of fields, but particularly music and poetry. Likewise, I feel a bit of guilt when out of practicality I must teach my poetry survey courses from the pages of anthologies that reduce not only well-known poetry books but also entire careers of poets to one or two examples, disparate pieces sometimes composed decades apart from one another. This fragmentation or severance of works seems only to enhance my uneasy feelings of disconnection or dissociation. Therefore, whether or not readers will necessarily apprehend the unifying elements or complementary features I imagine I have placed within my manuscripts of poetry like identical geometric facets sparkling on a cut gem, I continue to do so with some confidence. Consequently, when any readers or reviewers, as in this case, recognize my efforts, I am particularly pleased. I am grateful for their efforts exerted in careful consideration of the poetry and in discovering hints or deliberate links I have sometimes hidden within the works.